Previously, as part of my City and Guilds in Fashion Design, I did one term of draping on the stand. I made a seamless coat (apart from the inset sleeves). I have always thought I would like to know more so this term I signed up for classes at Morley college to learn more. Taught by New Yorker Linde Kinne we have been kept busy and have achieved high standards, despite the less than ideal mannequins we have been working with – how I long to get started on Camilla at home! To be honest the course has been quite hard work after a long day at the office, but after five weeks I have got a draped dress toile completed. Here is how I got started. After taping the stands at the waist, hip and shoulder we blocked our calico to make sure the grain was perfectly aligned. Then we put some guidelines on to the calico – a CF line, a bust line off it at right angles and the same with the waist and hips. The darting was fun to do – although we were aiming for one underarm and two waist darts my model only really needed one. Once the pinning was achieved (in a specific way) the neck line and armhole were drawn in. Then we moved on to the back. To be honest I found the process very slow and boring. Obviously there were different levels of experience in the class but I didn’t really see the point of creating a torso block which I could do to my own measurements with flat pattern cutting (paper and pencil). After five weeks, allowing for induction, paper work and fire drills I had the dress pattern completed. Although my stand was not exactly the right shape for me I added a little curving at the hip and managed to produce something that roughly fits. This means I could use this pattern to create a summer dress. However, as you can see from the clock, it was only 7.30, so there was time to move on to the next project. Hurrah! We have been asked to design a flared or tent dress, with a yoke, and then model it on the stand. Exciting! I was relieved to be going on from the basic pattern to actually draping, and set to work with gusto. I wondered if I might be able to do a version of the Claire McCardell monastic dress, which I wrote about before. Here are three versions of the Monastic or Future dress. I don’t intend to recreate the dress exactly as DaughterFish has, quite brilliantly, done. My brief, which includes a yoke, precludes this exact design. But I will be using it for inspiration (and I have fabric that I think will be suitable). Stay tuned. I hope that once the course ends I will be able to teach myself some more about draping using a book. I have bought Draping, The Complete Course, by Karolyn Kiisel. Anyone used it? Any experiences of draping? I look forward to hearing more about your class and your next project. How many modules of your city and guilds have you completed? I did the City and Guilds in Fashion (780) in 1986-87. I did parts 1 and 2 (a two year part time course). Kate, I am envious that you can take these courses!! Thanks you for sending me down a rabbit hole to the Callot Soeurs and the Villa La Pietra. It’s three hours before my brother’s wedding in Iceland and instead of getting more beauty sleep I am reading in the other room so as to not disturb Gianni. Hi Kate, loving your blog. I returned to sewing after many years “off” and I’m thoroughly enjoying my new hobby. Could I request you blog about superb easy patterns for beginners. I’ve loved the vogue wrap dress and have made three. I’m looking for Patterns that are easy but with style and that wow factor. Many thanks. Thank you Rachel – that is very kind of you. I always love suggestions for blog posts – actually thinking of topics is more difficult than writing them. I would be more than happy to do as you ask. It would help me a bit if you told me a bit more about what sort of thing you like. Feel free to comment here, or write to me kate(at)fabrickated(dot)com. That looks very interesting.I quite like the silhouette on the halter neck dress. I havent got round to draping…yet. I have been learning flat pattern drafting via Suzy Furrer Craftsy classes and am really enyoying it. I imagine I will egt to draping eventually as my skill grows. We were taught draping in our first year and each year we were expected to drape half of our patterns and produce a collection of clothes for the runway show at the end of the semester. Some students, the younger ones, loved the freedom of creating in that manner, while the few of us mature students loved the flat pattern method of precise measurements and using pencils and rulers. Knowing both can be a great help and training your eye to see the fine grainlines of the muslin/calico fabric is essential! Even if one never uses such a free way of designing, being able to see grainlines when they are curving or veering off in the wrong direction or making drag lines is so worth it! Thanks for the honest review. This does sound useful and I look forward to seeing your progress. Is that your own VW jacket on the chair? 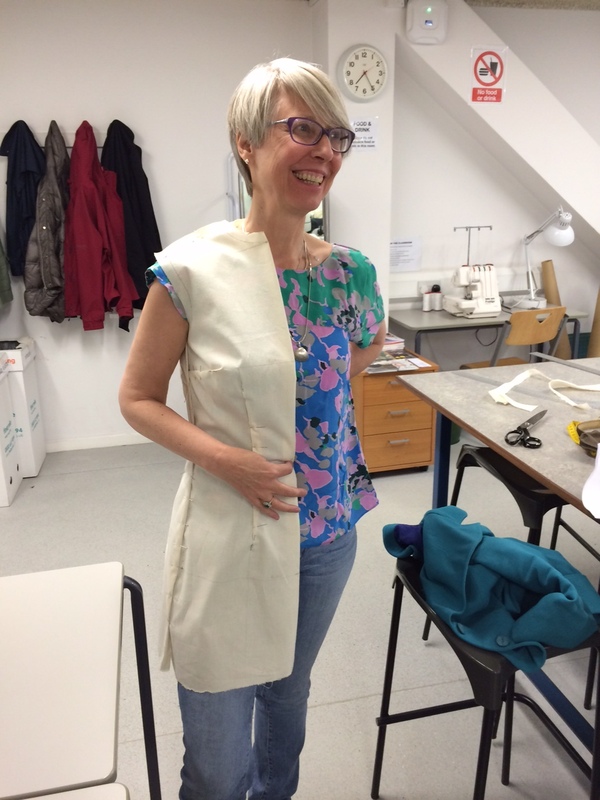 Thank you for sharing the pics of your draping class. You must be having a wonderful time exploring the techniques of draping. I find I use both flat patterning and draping, depending on what works better for a particular project. I have Carolyn Kissel’s book and it is fabulous. The DVD is good; I just wish the whole thing would play at once rather than needing to select each chapter. My copy is for the EU market so I can only play on a region free player. Another source, and maybe the best ever draping book, is Draping-Art & Craftsmanship in Fashion Design by Annette Duburg. It was out of print for quite awhile and only available from resellers at crazy prices (try $400). Thankfully it has been reprinted and is on Amazon for $55. Your draped sheath fits great. Are you planning to use the pattern for a finished garment? Thank you so much for your encouragement Mary, and advice on books. My teacher reckons I should be OK now learning from a book, given I have picked up a few things this term. I may use the sheath dress pattern, but probably not. I want to see what I can do now we have been “set free” to an extent. I will look up the Duburg book – you seem to have much better value products in the US – just a pity you can’t play our DVDs! I just got a second hand copy of the Duburg book for less than £50 so thank you very much for the recommendation. It does look great. Thanks again. 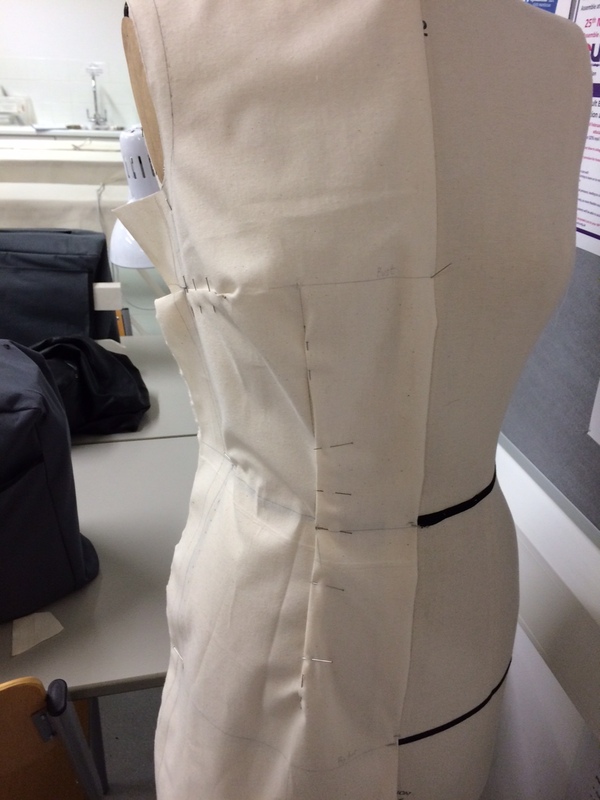 I attend a pattern cutting course, usually flat pattern cutting, but to speed things up, we were taught to drape the bodice (on each other) in our first term and we used the same book, which I bought. Perhaps it was the speedy nature of things but I found this less satisfactory for a personnel bodice than flat pattern cutting. However, it was fun trying to design by draping, though I don’t have much design imagination. I enjoy reading your posts.